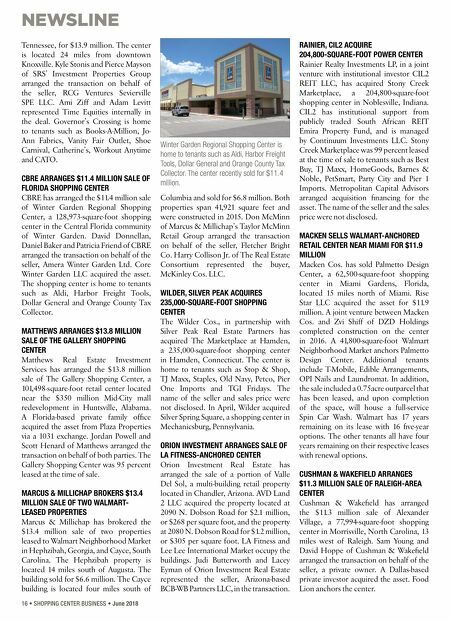 16 • SHOPPING CENTER BUSINESS • June 2018 NEWSLINE Tennessee, for $13.9 million. The center is located 24 miles from downtown Knoxville. Kyle Stonis and Pierce Mayson of SRS' Investment Properties Group arranged the transaction on behalf of the seller, RCG Ventures Sevierville SPE LLC. Ami Ziff and Adam Levitt represented Time Equities internally in the deal. Governor's Crossing is home to tenants such as Books-A-Million, Jo- Ann Fabrics, Vanity Fair Outlet, Shoe Carnival, Catherine's, Workout Anytime and CATO. CBRE ARRANGES $11.4 MILLION SALE OF FLORIDA SHOPPING CENTER CBRE has arranged the $11.4 million sale of Winter Garden Regional Shopping Center, a 128,973-square-foot shopping center in the Central Florida community of Winter Garden. David Donnellan, Daniel Baker and Patricia Friend of CBRE arranged the transaction on behalf of the seller, Amera Winter Garden Ltd. Core Winter Garden LLC acquired the asset. The shopping center is home to tenants such as Aldi, Harbor Freight Tools, Dollar General and Orange County Tax Collector. MATTHEWS ARRANGES $13.8 MILLION SALE OF THE GALLERY SHOPPING CENTER Matthews Real Estate Investment Services has arranged the $13.8 million sale of The Gallery Shopping Center, a 101,498-square-foot retail center located near the $350 million Mid-City mall redevelopment in Huntsville, Alabama. A Florida-based private family office acquired the asset from Plaza Properties via a 1031 exchange. Jordan Powell and Scott Henard of Matthews arranged the transaction on behalf of both parties. 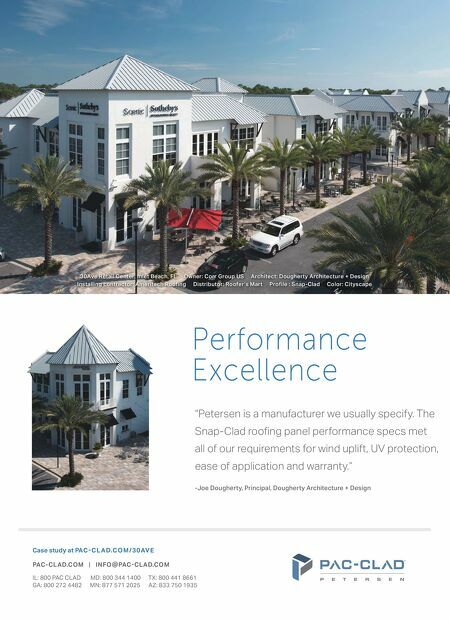 The Gallery Shopping Center was 95 percent leased at the time of sale. MARCUS & MILLICHAP BROKERS $13.4 MILLION SALE OF TWO WALMART- LEASED PROPERTIES Marcus & Millichap has brokered the $13.4 million sale of two properties leased to Walmart Neighborhood Market in Hephzibah, Georgia, and Cayce, South Carolina. The Hephzibah property is located 14 miles south of Augusta. The building sold for $6.6 million. The Cayce building is located four miles south of Columbia and sold for $6.8 million. Both properties span 41,921 square feet and were constructed in 2015. Don McMinn of Marcus & Millichap's Taylor McMinn Retail Group arranged the transaction on behalf of the seller, Fletcher Bright Co. Harry Collison Jr. of The Real Estate Consortium represented the buyer, McKinley Cos. LLC. WILDER, SILVER PEAK ACQUIRES 235,000-SQUARE-FOOT SHOPPING CENTER The Wilder Cos., in partnership with Silver Peak Real Estate Partners has acquired The Marketplace at Hamden, a 235,000-square-foot shopping center in Hamden, Connecticut. The center is home to tenants such as Stop & Shop, TJ Maxx, Staples, Old Navy, Petco, Pier One Imports and TGI Fridays. The name of the seller and sales price were not disclosed. In April, Wilder acquired Silver Spring Square, a shopping center in Mechanicsburg, Pennsylvania. ORION INVESTMENT ARRANGES SALE OF LA FITNESS-ANCHORED CENTER Orion Investment Real Estate has arranged the sale of a portion of Valle Del Sol, a multi-building retail property located in Chandler, Arizona. AVD Land 2 LLC acquired the property located at 2090 N. Dobson Road for $2.1 million, or $268 per square foot, and the property at 2080 N. Dobson Road for $1.2 million, or $305 per square foot. LA Fitness and Lee Lee International Market occupy the buildings. Judi Butterworth and Lacey Eyman of Orion Investment Real Estate represented the seller, Arizona-based BCB-WB Partners LLC, in the transaction. RAINIER, CIL2 ACQUIRE 204,800-SQUARE-FOOT POWER CENTER Rainier Realty Investments LP, in a joint venture with institutional investor CIL2 REIT LLC, has acquired Stony Creek Marketplace, a 204,800-square-foot shopping center in Noblesville, Indiana. CIL2 has institutional support from publicly traded South African REIT Emira Property Fund, and is managed by Continuum Investments LLC. Stony Creek Marketplace was 99 percent leased at the time of sale to tenants such as Best Buy, TJ Maxx, HomeGoods, Barnes & Noble, PetSmart, Party City and Pier 1 Imports. Metropolitan Capital Advisors arranged acquisition financing for the asset. The name of the seller and the sales price were not disclosed. MACKEN SELLS WALMART-ANCHORED RETAIL CENTER NEAR MIAMI FOR $11.9 MILLION Macken Cos. has sold Palmetto Design Center, a 62,500-square-foot shopping center in Miami Gardens, Florida, located 15 miles north of Miami. Rise Star LLC acquired the asset for $11.9 million. A joint venture between Macken Cos. and Zvi Shiff of DZD Holdings completed construction on the center in 2016. A 41,800-square-foot Walmart Neighborhood Market anchors Palmetto Design Center. Additional tenants include T-Mobile, Edible Arrangements, OPI Nails and Laundromat. In addition, the sale included a 0.75acre outparcel that has been leased, and upon completion of the space, will house a full-service Spin Car Wash. Walmart has 17 years remaining on its lease with 16 five-year options. The other tenants all have four years remaining on their respective leases with renewal options. CUSHMAN & WAKEFIELD ARRANGES $11.3 MILLION SALE OF RALEIGH-AREA CENTER Cushman & Wakefield has arranged the $11.3 million sale of Alexander Village, a 77,994-square-foot shopping center in Morrisville, North Carolina, 13 miles west of Raleigh. Sam Young and David Hoppe of Cushman & Wakefield arranged the transaction on behalf of the seller, a private owner. A Dallas-based private investor acquired the asset. Food Lion anchors the center. Winter Garden Regional Shopping Center is home to tenants such as Aldi, Harbor Freight Tools, Dollar General and Orange County Tax Collector. The center recently sold for $11.4 million.